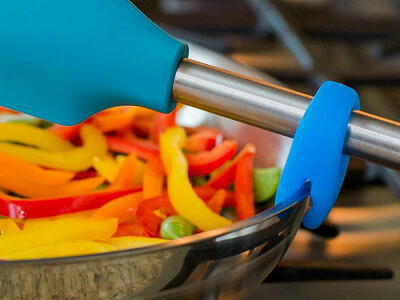 The Snug is a clever little kitchen gadget that solves a universal problem experienced by everyone from the casual cook to the gourmet chef. Invented by husband and wife team Shilpi and Shrenik, the Snug prevents utensils from getting too hot to handle, or even worse, melting and burning. It also stops spoons from making a mess on your kitchen counter and from slipping into large pots, pans and serving dishes. The Snug can even be used to prop open a lid to let steam escape so the contents of your pot won’t boil over. 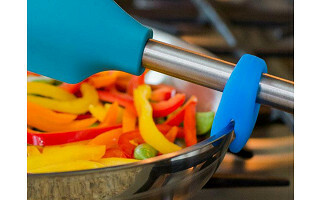 Thoughtfully engineered to fit utensils of multiple sizes and work on pots with or without a lip, the Snug is easy to attach, detach, and wash either by hand or in the dishwasher. Designed without nooks, crannies, or edges to inhibit food build-up and bacterial growth and made of FDA approved food grade silicone for heat resistance up to 570°F, the Snug is an innovative, elegant spoon rest you and your utensils can rely on. Hi – I am Shrenik and I am the Founder of ThinkHat. My wife, Shilpi and I are “perfectionists” when it comes to cleanliness and order around the house. The Snug is our first product and it screams fun, functionality, quality and minimalism. We both love to cook and the Snug is our first step towards getting order in the kitchen. The Snug is for someone who questions why we need to continue cooking with our hands getting burnt by hot metal utensils, why our favorite plastic spatulas need to melt, why our wooden stirring spoons need to have ugly burn marks on the stove, why our serving spoons need to slide into dishes and cause a mess. Months of research (for the right fit), industrial design (for the cool looks) and engineering development (for sizing and material selection) has gone into these nifty and chic little gadgets that are made of 100% FDA compliant food-grade silicone, heat-resistant to 570F (300°C), dishwasher safe, and fits most utensil handles out there. We thank The Grommet for introducing us to their community and we hope that you love the Snugs. I've got to have this! We are always attending church pot lucks and we're constantly catching someone having to dig the serving spoon out of the bowl. This is the perfect solution! Thank you. Hi Theresa, Amy from The Grommet team here. Thanks for your support. We like it too. @Theresa Thanks for your comment. You will surely love these for helping out with the serving spoons, and it will also add colors to your food display. The Snug is a clever little kitchen gadget that solves a universal problem experienced by everyone from the casual cook to the gourmet chef. Invented by husband and wife team Shilpi and Shrenik, the Snug prevents utensils from getting too hot to handle, or even worse, melting and burning. It also stops spoons from making a mess on your kitchen counter and from slipping into large pots, pans and serving dishes. The Snug can even be used to prop open a lid to let steam escape so the contents of your pot won’t boil over.